Galway’s fade into spirit is as instructive as his poetry. I last saw him on August 7 at the Vermont Statehouse for a celebration of his life and art. He was frail and, sadly, nearly uncommunicative when asked for closing remarks. His son came to his side and said the thank-yous Galway was struggling to say. He already had that faraway focus that spoke to me of his impending journey to another place. I used to play tennis with Galway at Lyndon State College and in St. Johnsbury. I’m very competitive. When playing doubles with Galway in the mix, I could lighten up and enjoy the game and give up caring about the outcome. But when he and I played singles, I took it personally. I attacked the net and put those games away quickly. He was always surprised to see how much more effective I was as a singles player than as a doubles player. I didn’t have the nerve to say that was because I have always wanted to write a better poem than he, or at least one that competed in the same arena. I never could. I never did. So I turned to prose. I have three books in print. One book of short stories and two novels. I have always wanted to drive to Galway’s farmhouse in Sheffield and present these books to him as evidence of my effectiveness with the written word. 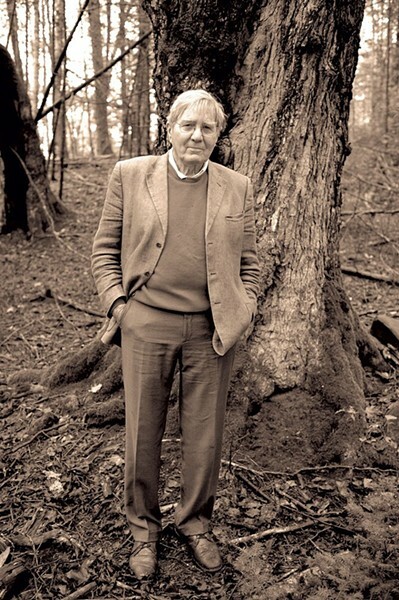 But the writer part of me has always been humbled by Galway, by his energy and passion for all things as much as by his poetry, and so I have never been able to make that drive. I know now that the best I can do as a writer is to circle in orbit around the poet Galway Kinnell. But that’s how it should be for lesser planets. Galway is gone, and yet, thankfully, Galway remains a compelling force of gravity, a pathfinder, a prophet, a voice from the dark. 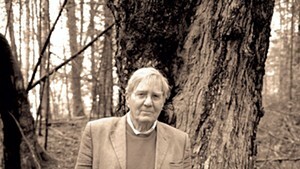 Editor's note: Galway Kinnell was born in 1927 and held the post of Vermont's Poet Laureate from 1989 to 1993. Last August, Lisa von Kann, founder of Back Roads Readings, organized a celebration of his life and work at the Vermont Statehouse (read more here). Read his New York Times obituary here. L.E. Smith is the author of a short story collection, Views Cost Extra, and two novels, Travers' Inferno and The Consequence of Gesture, all published by Fomite Press. He lives in Brookfield.